My 10 year old has been desperately wanting a Furby. After saving & saving & saving & saving & saving her moolah, she finally got one! It came home yesterday & she was so excited! We inserted the 4 AA batteries & then sat & watched. It is actually really cute. It was giggling & even farted in my hand. We downloaded the free iphone Furby app & it is so much fun. You can virtually feed it different foods & there is even a feature that translates the furbish-gibberish language. Mostly it says it's hungry or you're funny or it's hungry again or it loves you or it's happy or "please feed me". The Mr. sat down for a few minutes of play with the newest member of our family. Boys just don't play the same as girls. He pretty much tortured the little guy. Yanking its tail, poking it in the side. And, for the first time the Furby said, "Me no like." Zoey quickly retrieved her pet from The Pesterer. The Furby eventually started talking about how tired it was, which goes something like this: "Mee-Mee-Way-Loh". After it snored itself to sleep, we all continued on in whispered conversations. And then I realized I was whispering so a battery operated toy could peacefully sleep. So I stopped whispering & intentionally talked really loudly, so the Furby would know who's boss of this nest. The Furby has a few different personalities & it's a mystery as to which personality your Furby will have. Apparently the personality it gets is based on how you play with it. (There are 6 programmed personalities.) But in just 24 hours, Zoey's Furby has changed into 5 personalities, several times. First, it was very silly & cute. It laughed a lot & had the sweetest little voice. 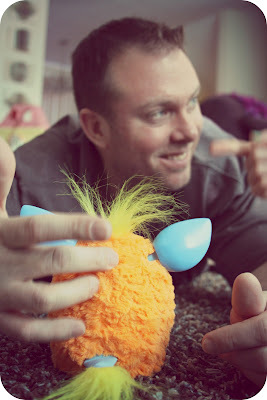 Then, while sitting on the couch with the Furby next to me, it got all weird & started freaking out & said, "Me change!!" Its eyes closed & I could see crazy flickering lights behind its eyelids. Then it opened its eyes & was a completely different Furby: one that loved to sing. Zoey also experienced a Furby with a very snobby princess-type personality while playing in her room later in the afternoon. It also changed into a gruff/rude/big dude kind of Furby. And then we were visited by the valley girl/OMG/sarcastic/talkative Furby. It is so disrespectful. (Plus, it is very difficult to feed it because it won't. stop. talking.) And I admit: I've never wanted to punch a Furby in the face until now. Honestly, it all sort of reminds me of that Sally Field movie, Sybil. But worse: it's all bundled into a furry toy that resembles a Gremlin. (Gremlins: a movie that established my ongoing fear of the dark.) I swear, if I hear that thing talking in the middle of the night I will scream. I will scream & run out of the house. Through all its changes & transformations, the talkative Furby is the one who lives with us most. Why won't she just go away? Leave us alone! I'd much rather have the rude Furby who burps loudly & enjoys eating underwear sandwiches. Or the sing-song Furby who won't stop asking for hugs & constantly hums random melodies.